On May 3, 2014 the JDC junior journalists visited Samsunghyeol park on Jeju Island. There were some people there who came to walk around or travel through Jeju. 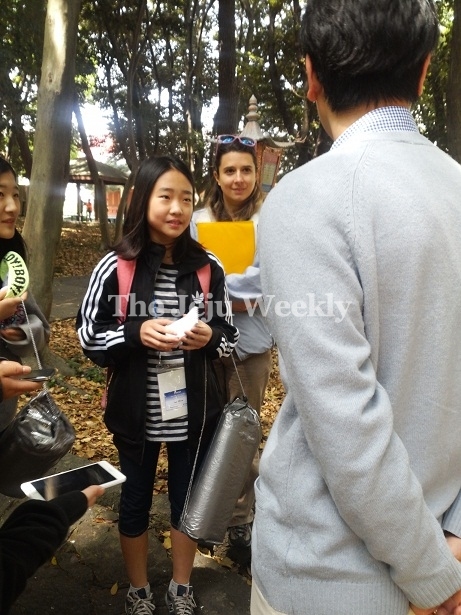 The journalists walked through Samsunghyeol interviewing many people who were visiting from different parts of Korea. Samsunghyeol has a famous legend regarding where it came from. 4300 years ago three man were born from the holes in Samsunghyeol whose first names were Ko,Yang,Bo. They married with three princess and built up life here. This legend is start of the Jeju island and this legend is important even now. Why don’t you spend a day enjoying Jeju’s natural beauty and Sandsunghyeol’s legendary story?